New UC IPM online course provides 2 CEU in laws and regulations. Do you need some more laws and regulations continuing education units for your license renewal? A new online course from UC IPM can help you get those units as well as help growers prevent illegal pesticide residues. The California Department of Pesticide Regulation (DPR) runs the most extensive Pesticide Residue Monitoring Program in the nation and is hard at work ensuring that the fruit and vegetables we purchase and consume are free from illegal pesticide residues. Just last month, DPR detected residues of a pesticide not registered for use on grapes and fined the grower $10,000 for using a pesticide in violation of the label and for packing and attempting to sell the tainted produce. Cases like this are rare in California but remind growers how important it is to apply pesticides correctly by following all pesticide label directions. Understanding and following label instructions is the focus of a new online course developed by the University of California Agriculture and Natural Resources Statewide Integrated Pest Management Program (UC IPM). Course participants are presented with several real-life scenarios. They must search through actual pesticide labels to determine if the scenario illustrates proper use of pesticides or if the described situation could potentially lead to illegal residues. The overall goal of this course is to have participants follow pesticide label instructions when they return to the field. Following the label can eliminate incidences of illegal pesticide use. Proper Pesticide Use to Avoid Illegal Residues is published just in time for pest control advisers and pesticide applicators who are still a few units short to renew their licenses or certificates with DPR. The course has been approved for 2 hours of Pesticide Laws and Regulations continuing education units (CEUs) from DPR and costs $40. If you don't need CEUs, but are still interested in viewing the course content, check it out for free on YouTube. DPR recommends that renewal packets be submitted before November 1 in order to receive your renewed license or certificate by December 31, as the processing time can take up to 60 days. For additional online courses that UC IPM offers, visit the online training page. 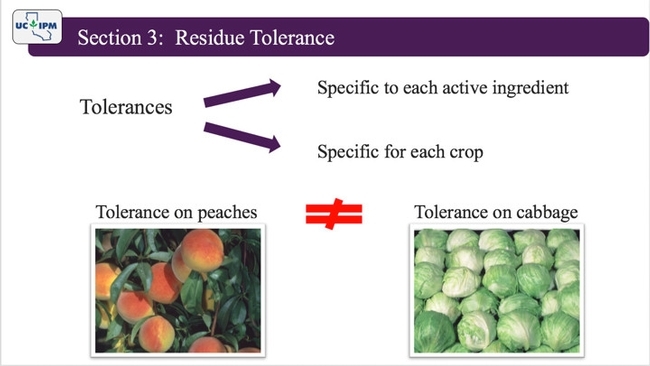 Pesticide residue tolerances are specific to each active ingredient and each crop.